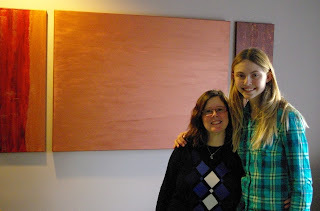 My painting entitled "Golden Sky" in now hanging in Toronto in a young women's very cool place. It flows well with the colours in the room, and its metallic and reflective hues make it shine and sizzle in the room. It's one of my largest pieces, and its good to see it hanging on a wall.